Sydney “Chip” Farrar is a 2018 graduate of Columbia Business School and President of Wren Industries, a North Carolina based family-office. 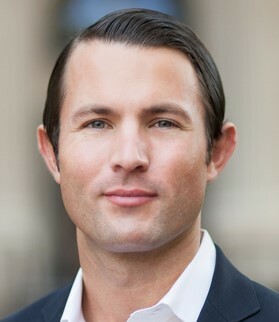 Prior to business school, Chip spent three years as an analyst and associate on the hedge fund investment team with Goldman Sachs Asset Management (GSAM) after interning on a sales and trading desk through the Goldman Sachs Veterans Integration Program (VIP). After separating from active-duty service, he spent a year in Washington D.C. as a senior consultant with Booz Allen Hamilton, where he focused on public policy analysis. In the Marine Corps, he served as an active-duty infantry officer with 1st Battalion 7th Marines and reserve officer with 4th Reconnaissance Battalion. He deployed on the 31st Marine Expeditionary Unit as a Weapons Platoon Commander. Chip holds a BA in history and political science with distinction from the University of Mississippi. He also serves as a member of the Columbia Business School Ambassador’s Program, a class agent of the Woodberry Forest School, and board member for Old North State Trust LLC. He resides in Durham with his wife, Emily, and rescue pit-bull terrier, Belle.